As the reader of this geeklist may already know, we have developed a new board game by the name of Three Kingdoms Redux. It is based on the three kingdoms era, focusing on the states of Wei 魏, Wu 吳 and Shu 蜀. The rules have been posted, artwork is ongoing, some pictures have been shared, and we expect manufacturing to take place in 2014. We have placed a lot of importance on capturing the historical theme in Three Kingdoms Redux. 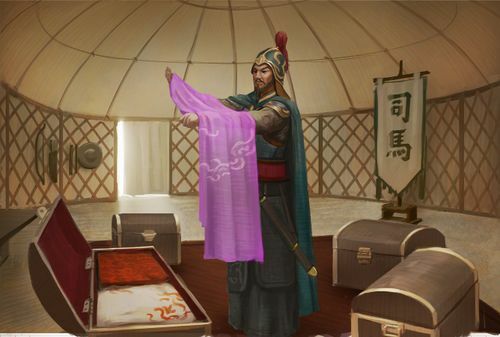 Besides tying the game mechanics to the various historical aspects of the three kingdoms era, as discussed in a previous geeklist, artwork is another avenue via which theme was enhanced. Of the artwork, the illustrations of the generals are particularly eyecatching. 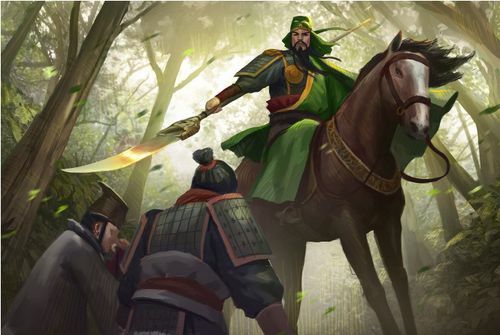 Based on our research of all the generals included in Three Kingdoms Redux, we requested our artist, Ray Toh, for illustrations of them in the most historic and/or heroic moment of their respective careers. In this geeklist, we share with you 12 of these general portraits and describe the historical background of each portrait. It is worth noting that there are a total of 69 generals in Three Kingdoms Redux, 23 generals per state. The artwork for all 69 generals of Three Kingdoms Redux has since been collated and published in the Three Kingdoms Redux: Generals' Illustration Booklet. Cao Cao was the warlord that laid the foundations of the state of Wei. He paved the way for his son, Cao Pi, to become emperor, though he himself did not do so. The Battle of Guan Du was pivotal in the development of Wei. Leading up to it, Yuan Shao had defeated Gongsun Zan and reunified northern China. Cao Cao's forces were inferior to Yuan Shao's in terms of numbers. Despite that, after initial skirmishes, a standoff between Yuan Shao and Cao Cao developed at Guan Du. Time was not on Cao Cao's side as his supplies were running dangerously low. He persisted and was rewarded when an advisor of Yuan Shao defected and informed Cao Cao of weaknesses in Yuan Shao's supply depot at Wu Chao. Wu Chao was vital to Yuan Shao's forces, but was poorly defended. Cao Cao took decisive action and ordered a raid on that same night. 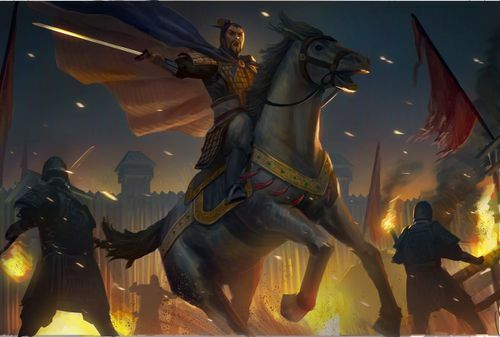 In the picture above, we see Cao Cao, riding his Zhuahuang Feidian horse, with Yitian sword in hand. He is in Yuan Shao's supply depot at Wu Chao and granaries can be seen. Cao Cao is using his sword to command his troops to set fire and destroy the depot. Sima Yi was a military commander and advisor of Wei, serving under three generations of the Cao family, namely Cao Cao, Cao Pi and Cao Rui. Sima Yi was initially unwilling to partake in politics and only joined Cao Cao after repeated attempts by the latter to recruit him. During Cao Pi and Cao Rui's reigns, Zhuge Liang of Shu led a series of northern expeditions, in an effort to defeat Wei and reunify China. The last of these northern expeditions was known as the Battle of Wu Zhang Yuan, and his adversary was none other than Sima Yi. Sima Yi understood the difficulties of the Shu forces in keeping themselves supplied. He therefore closed his gates and ordered his troops not to engage the enemy. The Battle of Wu Zhang Yuan became a lengthy stalemate between the two forces. Zhuge Liang tried to provoke Sima Yi into attacking his own forces by sending Sima Yi women's clothing, implying that the latter was a coward. Sima Yi's subordinate generals were incensed and demanded permission to engage. Sima Yi refused and admonished his subordinates with the famous quote: "Incapacity to tolerate small frustrations will lead to inability to accomplish big tasks." In the picture above, we see Sima Yi admiring Zhuge Liang's gifts of women's clothing shortly after receiving the gift. He goes on to predict correctly that Zhuge Liang is running out of time and patience with the long stalemate, and will pass away soon. Xu Chu was a fiercely loyal bodyguard and general of Cao Cao. This quality earned him the nickname of Tiger Fool. Xu Chu took over Dian Wei's role as commander of Cao Cao’s personal guards after Dian Wei's death. He also commanded troops and took part in various major battles, e.g. Battle of Guan Du against Yuan Shao. After the crushing loss of the Battle of Chi Bi (Red Cliffs), Cao Cao retreated north and turned his attention to the northwestern areas. This culminated in a faceoff with a coalition of northwestern warlords led by Ma Chao, in a battle widely known as the Battle of Tong Pass. In the initial part of the battle, Cao Cao sent his main forces to cross the Ji River, with the aim of circumventing Tong Pass, while he held the rear with Xu Chu. As it turned out, Ma Chao got wind of this and gave chase with his cavalry. Cao Cao hurriedly tried to cross the river as arrows rained down on his troops. At this vital moment, Xu Chu put his own body on the line to protect Cao Cao. 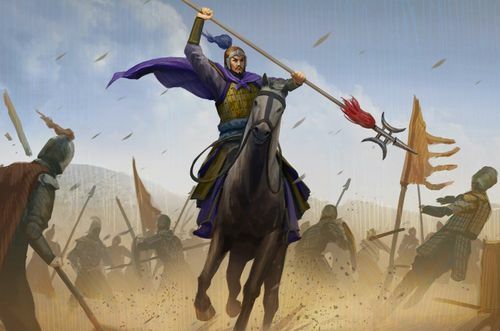 In the picture above, we see Xu Chu using a discarded horse saddle as a shield against incoming arrows. The boatman has just been killed, and Xu Chu takes over to push and steer the boat. 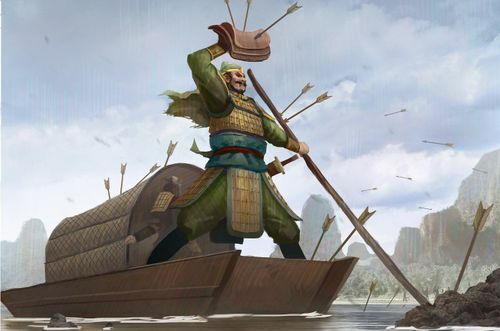 Behind him, Cao Cao can be seen moving to the front of the boat to escape the rain of arrows. Zhang Liao was initially a military general of Lu Bu. The latter's defeat by Cao Cao saw Zhang Liao surrender to Cao Cao. Thereafter, Zhang Liao took part in various military campaigns, including the Battle of Guan Du against Yuan Shao. His greatest contributions, however, relate to the defence of the He Fei area. After the Battle of Chi Bi (Red Cliffs), Cao Cao retreated north to recover from the heavy defeat. Along the border shared with Wu, he stationed his trusted generals to defend against possible incursions from Wu. Zhang Liao was ordered to defend He Fei together with Yue Jin and Li Dian. As it turned out, Sun Quan did attempt an attack on He Fei. The resulting battle was known as the Battle of Xiao Yao Ford. Cao Cao had left instructions that Zhang Liao and Li Dian were to engage the Wu forces as soon as they reached He Fei. This was despite being heavily outnumbered by the Wu forces. To add to Zhang Liao's troubles, the three Wei generals were also known to not get along with one another due to personal feuds. Zhang Liao's strong leadership skills came to the fore, and he convinced his colleagues to place personal feuds aside in favour of the state's interests. He understood the intention of Cao Cao’s instructions: To puncture the enemy’s morale before the battle commences. In the picture above, we see Zhang Liao, halberd in hand, leading 800 elite men in and out of the Wu masses. The ferocity of his attack takes the Wu forces by surprise. After fighting his way in and out of the encirclement once, Zhang Liao hears the pleas for help from some of his men still caught in the encirclement. Upon which, he fights his way back in, and leads the remaining troops out. Sun Jian was a warlord from Jiang Dong reputed for his military prowess. His sons, Sun Ce and Sun Quan, were to build on his initial work to establish and develop the state of Wu. The Sun family was also believed to be descendants of the renowned military strategist, Sun Zi (Sun Tzu). The initial period of the three kingdoms' era was chaotic. The tyrannical Dong Zhuo's control of the Han court led to the formation of a large coalition against him. Sun Jian was one of the warlords joining the coalition. Indeed, Sun Jian acted as the coalition forces' vanguard and defeated Hua Xiong, one of Dong Zhuo's key generals. The defeat forced Dong Zhuo to move the capital westwards, from Luo Yang to Chang 'An. Sun Jian then led his forces into Luo Yang, only to find it in ruins as Dong Zhuo had sacked it before fleeing. In the picture above, we see Sun Jian discovering a shimmer of light from the bottom of a palace well. A search led to the discovery of the imperial jade seal. This was interpreted by his subordinates as a sign of greater things to come for Sun Jian. 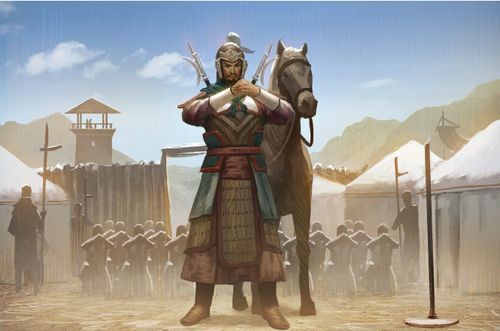 Hanging by his side is the Guding sabre, Sun Jian's weapon of choice, and in the background is his Huazong horse. Zhou Yu was the naval commander-in-chief and main strategist of Wu, as well as a close childhood and teenage friend of Sun Ce. The early years of Sun Quan's reign were spent stabilising the young state. In the meantime, Cao Cao had defeated Yuan Shao, reunifying the north. Following the victory, Cao Cao turned his attention to the south and the Jiang Dong region. He intimidated Sun Quan to surrender to spare bloodshed to his people. Sun Quan's court was split into two factions, one advocating surrender, the other advocating resistance. Zhou Yu, leading the latter faction, convinced Sun Quan to defend his land rather than to give up sovereignty. This led to the formation of an alliance with Liu Bei and the Battle of Chi Bi (Red Cliffs). Sun Quan appointed Zhou Yu as the naval commander-in-chief for the forthcoming battle, assigning 50,000 men to him. Cao Cao is reported to have over 800,000 men with him. 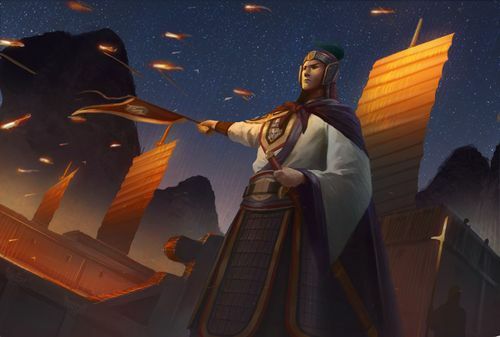 In the picture above, we see Zhou Yu commanding his naval forces in the main raid of Cao Cao's naval base. He catches Cao Cao's forces by surprise and with the help of favourable winds, sets Cao Cao's vast fleet and naval base on fire. In his left hand, we see the sword granted to him by Sun Quan when he was appointed as the naval commander-in-chief. Huang Gai was a military general who joined Sun Jian when the latter was recruiting to quell the Yellow Turban Rebellion. He was also involved in the coalition's campaign against Dong Zhuo. Huang Gai went on to serve both of Sun Jian's sons, Sun Ce and Sun Quan. It was during the Battle of Chi Bi (Red Cliffs) that Huang Gai made his most significant contribution to Wu's cause. He hit upon the idea of a fire attack on Cao Cao's forces, reasoning that it was Wu's only chance at victory, given Cao Cao's superior numbers. He shared the strategy with the naval commander-in-chief, Zhou Yu, and was sworn to secrecy as Zhou Yu had the very same idea! They reasoned that for the strategy to have a chance of succeeding, they would have to get their own ships up close to Cao Cao's fleet. Huang Gai therefore feigned surrender to Cao Cao, who fell for the ruse. In the Romance of the Three Kingdoms novel, the ruse involved Zhou Yu and Huang Gai acting out a public fallout. The latter was subject to a public beating to fool Cao Cao's spies. Cao Cao, duly informed by his spies, bought into Huang Gai's surrender. 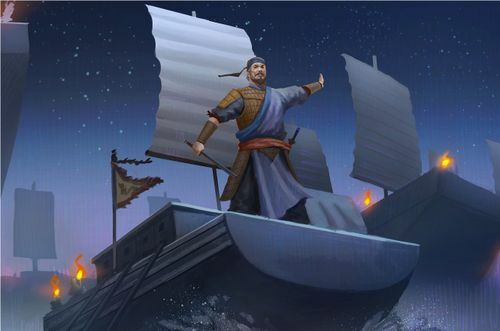 In the picture above, we see Huang Gai leading fire ships towards Cao Cao's fleet and naval camp. His left hand is raised as he gives the order to set fire to his fire ships, which will then ram into Cao Cao's fleet. In his right hand, he is holding his weapon of choice, the Tie Bian. Taishi Ci was a military general recruited by Sun Ce during his Jiang Dong expeditions. Sun Ce had led a small band of militia south to Jiang Dong to establish his own territory. One of the minor warlords he fought with was Liu Yao, who had under his service a promising general by the name of Taishi Ci. Despite Taishi Ci's military capabilities, he was overlooked by Liu Yao and his military strategies not heeded. That ultimately led to Liu Yao's defeat. Although Taishi Ci did not participate in Liu Yao's battle with Sun Ce, he did chance upon the latter at Shen Ting. A lengthy duel followed, which ended in a stalemate, but left a deep impression on Sun Ce. After defeating Liu Yao, Sun Ce expended much effort to capture Taishi Ci. He treated the captured Taishi Ci with respect and that convinced Taishi Ci to serve under him. In the Romance of the Three Kingdoms novel, Taishi Ci noted Sun Ce's modest army size and requested permission to leave camp for a day to round up his former followers to bolster Sun Ce's numbers. Taishi Ci promised to return by noon the next day. Sun Ce agreed without hesitation, but many of his subordinates questioned the decision openly. In reply, Sun Ce stated that Taishi Ci was a man of honour and would abide by his words. 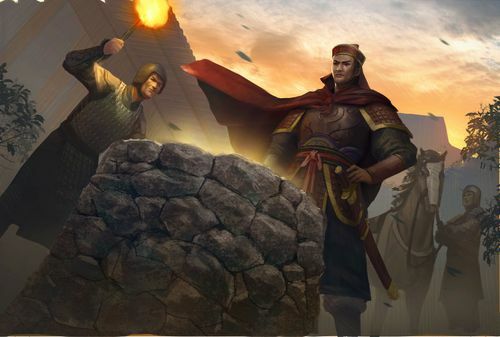 In the picture above, we see Taishi Ci returning to Sun Ce's camp after rounding up his former followers. Sun Ce's generals did not believe Taishi Ci would return, and had affixed a bamboo pole to keep track of time. As it turns out, Taishi Ci returns at the stroke of noon; note the lack of a shadow under the bamboo pole. On Taishi Ci's back, are his weapons of choice, his short halberds. Liu Bei was the founding emperor of the Shu state. He was also a descendant of the Liu clan that ruled the Han dynasty. For most of his political career, Liu Bei did not possess a home base for any sustained period of time. A string of defeats saw him moving from Ping Yuan in the north to Xu Zhou in the central plains area and to Xin Ye in Jing Zhou. Even Xin Ye was just a small commandery under Liu Biao. Liu Biao's death, the formation of an alliance with Sun Quan and the subsequent defeat of Cao Cao afforded Liu Bei the opportunity to annex his own territories. His initial territorial gains were from south Jing Zhou. His able advisor, Zhuge Liang, advocated the need to establish a permanent base, and pointed out Yi Zhou (west of J ing Zhou, present day Sichuan area) as a suitable candidate. Yi Zhou was then ruled by Liu Zhang, widely perceived as a weak leader. Liu Bei eventually invaded Yi Zhou, and aided by a number of defections from Liu Zhang's camp, captured it. In the picture above, we see Liu Bei accepting Liu Zhang’s surrender of Yi Zhou. Liu Zhang is kneeling and offering the seal of Yi Zhou's governorship to Liu Bei. Behind Liu Bei is his white Dilu horse. Zhuge Liang was the first prime minister of Shu. His achievements and fame is such that his name has become synonymous with intelligence in Chinese culture. Liu Bei most famously paid Zhuge Liang, nicknamed "Sleeping Dragon", three personal visits to recruit him. During the third visit, Zhuge Liang presented the Longzhong Plan to Liu Bei. Zhuge Liang only agreed to join Liu Bei's forces after much persuasion by the latter. With Zhuge Liang's aid, Liu Bei annexed south Jing Zhou and Yi Zhou to found the state of Shu. At Liu Bei's deathbed, Zhuge Liang was appointed as regent to the new emperor, Liu Shan. The early part of Liu Shan's reign saw rebellions in the south by the Nan Man tribe. Zhuge Liang personally led troops south and pacified the Nan Man. Upon returning, Zhuge Liang took it upon himself to realise Liu Bei's ambition of reunifying China. In a passionate memorial to Liu Shan, he requested for permission to lead a northern campaign against Wei. A famous quote attributed to him was part of that memorial: "To bow to the extreme and not stopping until death". Moved by his loyalty, permission was granted by Liu Shan. 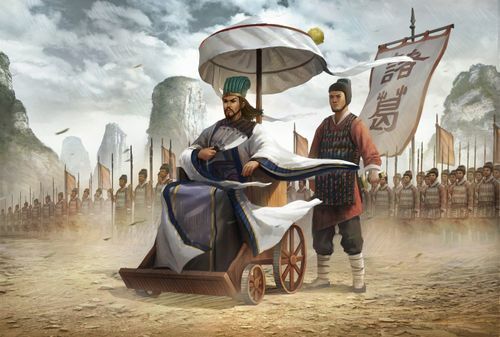 In the picture above, we see Zhuge Liang seated on his four-wheeled car, and holding the iconic Kong Ming fan. Kong Ming is Zhuge Liang's other name and the Kong Ming fan has since become a symbol of Zhuge Liang. In the Romance of the Three Kingdoms novel, Wang Lang of Wei had volunteered himself to engage Zhuge Liang in a debate and to persuade the latter to surrender during Zhuge Liang's first northern expedition. Wang Lang is soundly defeated in the battle of words and reason, and dies from the shame of the loss. Guan Yu was the loyal sworn brother of Liu Bei. He is widely known for his sense of righteousness and honour, and worshipped by the Chinese as a deity. Cao Cao had defeated Liu Bei and captured Xu Zhou in a battle. In the ensuing chaos, Guan Yu lost touch with Liu Bei and was captured. Having no news of Liu Bei and with Liu Bei's immediate family under his care, Guan Yu reluctantly surrendered to Cao Cao. Cao Cao admired Guan Yu's character and appointed him as a general. He also bestowed many gifts upon Guan Yu. Guan Yu repaid Cao Cao's favours by slaying Yan Liang of Yuan Shao in battle, then left when he received news of Liu Bei's whereabouts. Years later, Cao Cao was defeated soundly at the Battle of Chi Bi (Red Cliffs), and led his remnant force on a retreat back north. Sun Quan and Liu Bei laid a series of ambushes along Cao Cao's likely path of retreat. In the Romance of the Three Kingdoms novel, Guan Yu was assigned to guard Hua Rong road. In the picture above, we see Guan Yu blocking Cao Cao's path of retreat. Cao Cao's troops had already been subjected to many ambushes and were in no shape to fight. Cao Cao consults with his advisors, and the consensus is to appeal to Guan Yu's sense of righteousness. Having shown Guan Yu mercy during the Battle of Xu Zhou, and indeed treating him with much respect, Cao Cao may be able to convince Guan Yu to reciprocate the favour. Cao Cao and his men therefore kneel and beg for Guan Yu's mercy. In Guan Yu's right hand is his weapon of choice, the Qinglong Yanyue Dao. Guan Yu is riding the Chitu horse, which is reddish brown with a vertical white strip between its eyes. The horse is one of the gifts bestowed upon him by Cao Cao. Zhang Fei was the other sworn brother of Liu Bei. Together with Guan Yu, they were the earliest followers of Liu Bei and he followed Liu Bei from his early exploits to the formation of Shu. When Liu Bei sought refuge with Liu Biao at Jing Zhou, he was assigned to Xin Ye, a small commandery in northern Jing Zhou, to guard against the likes of Cao Cao. Liu Biao had two sons, Liu Qi and Liu Cong. He favoured Liu Cong, though Liu Qi was the eldest son. When Liu Biao passed away, Liu Qi was not in Xiang Yang, the capital of Jing Zhou. Via political manipulations by his supporters, the relatively youthful Liu Cong was installed as the new governor of Jing Zhou. Cao Cao invaded Jing Zhou shortly after and Liu Cong was persuaded to surrender. Liu Bei, guarding the northern part of Jing Zhou, had no choice but to flee south. The people of Xin Ye held him in high regard, and followed him. Liu Bei hoped to reach Jiang Ling in the south, which had plentiful supplies. Thus began a lengthy and painful trudge south. Cao Cao, getting wind of this news, dispatched his light cavalry in pursuit. He eventually caught up with Liu Bei's forces at Chang Ban. Zhang Fei was part of a desperate rearguard action against Cao Cao's rampaging forces. In the picture above, we see Zhang Fei alone at one end of Chang Ban bridge, challenging Cao Cao's army, which is at the opposite end. Behind him is a wooded area. He had ordered some of his troops to tie branches onto their horses' tails and to ride around in the wooded area, stirring up dust as they do so. This gives the perception that Zhang Fei is supported by a strong reinforcement force. Zhang Fei is riding his Yuzhui horse, which is dark brown in colour, and holding his weapon of choice, the Zhangba Se spear.